When I started to think about the topic, it gave me relatively new insight in the field of maritime safety and marine environment. Lot of maritime accidents and pollution happen every year due to lack of safety measures taken , human error and lack of training on safety of the procedure. Research and development , case study analysis, past history help us to improve the current procedures and equipments. The research and development is directly proportional to the incentives. R&D is higher when the incentive is higher. Since the incentives in the maritime industry are less comparable to technological , pharmaceutical and manufacturing industry, the R&D is smaller. But we cannot blame the maritime industry for that , since maritime industry is smaller in scale when compared to technological, pharmaceutical and manufacturing industry. Higher incentives should be given for R&D. It can be done by imposing strict rules. For eg. By 1st Jan 2015 fuel oil sulfur limits should be limited to 0.1% m/m inside an emission control area and by 1st Jan 2020 fuel oil sulfur limits should be limited to 0.50% m/m outside emission control areas. This strict regulation by MARPOL will lead to R&D by shipping companies and other machinery and technological manufacturers. Here the incentive for the shipping company is , if it complies the regulation then it will get the trading and other certificates in order therefore the vessel will get cargo and it will be in trade without difficulties. The machinery and technological manufacturers will get the incentives if they invested in R&D and if they found new innovation in a sulfur limit reduction in fuel oil , their product will get more sales which will lead to more profit. But if they lose , the current marine diesel oil has to be clean for less sulfur content which will ultimately lead to more fuel price and now ship owners has to subsidize the price with other to gain profit which will result in higher freight rates. There are some ship’s emergency procedure and equipment which will be under critics in safety meetings and other safety seminar.The procedure for emergency situations like abandon ship, man overboard, fire, collision, oil pollution, cargo spills, Enclosed space entry, ship shore interface, ship – port security , mooring and tug operation, master pilot information exchange changes day by day due to the case study, accidents, technological advancement, period etc… I would like to discuss about the man overboard situation detially through this essay through my reasoning power. I chose a man overboard because many of the man overboard were unsuccessful. The rate of success is lower in the man overboard situation. The ultimate safety culture develops when the person feels that he will be safe even something weird happens. For eg., crew member should feel very confident that even if he goes overboard that he will be saved. Developing such safety culture in this world will bring a better future for a living. Now let us analyze a man overboard situation in detail. What is Man overboard ? A man overboard is a situation in which the person goes overboard due to the negligence of the person and falling into the water. I am going to consider two imaginary man overboard situation and am going to analyze various aspects of it. The vessel MV. Ore phoenix, a VLOC sails from Brazil to Rotterdam fully loaded. During morning routine Chief Officer James giving a day’s work routine to bosun. Now bosun orders able seamen John to paint the fairlead rollers in the poop deck. Now the able seamen at 1100 hrs has stopped painting and he was leaning and peeping on to ship side to look the name board which he painted a couple of days before in anchorage. Suddenly he tripped into the sea due to the oily rags on the floor. Since he was missing in the mess room, Nobody had noticed till lunch. At 1300 Hrs, he dint return to work so the crew members suspected something wrong. Crew members started searching for him throughout the vessel and concluded he is missing from the vessel at 1400 hrs. Now the vessel turned and steamed for 4 hours in the reverse course until he is last seen. The vessel is unable to find able seaman John. The main cause of the vessel unable to rescue the able seamen John is , the vessel does not have sufficient time to rescue and does not have the system which immediately can notify the crew if some person goes overboard. There is a safety management system in every company that explains the procedure to be followed during man overboard. But there is a need for developing system which informs us that the man is overboard even without the presence or vicinity of the person. In this situation we can argue that he is not supposed to lean and peeping outside the ship. Even there is a lot of safety training and programs , we cannot control the human behavior. Human beings are complex creature and hard to predict the behavior. However inducing fear into the system can resolve the problem. I would like to induce the system in the ship such that able seaman John should not think of learning and peeping on to the ship’s side, even though he have leaned and fell down , there should be a chance to get back to the ship. Well , How it can be done? We will see what will happen if the guard rail on the ship side is raised a couple of feet ? Say 4 feet. Now the Able seamen John may be reluctant or lazy to go to ship side and lean. But still there is a chance of leaning if he has more curiosity to see the ship’s side. Raising the guard rail in this situation dint solve the purpose. May it can make things worse or better. It depends wholly on the individual. Now how can I reduce the curiosity of John further?. I cannot blindly say that raising the guard rail height will prevent the seafarers going overboard. I should investigate whether it affects the shipboard operation and it should not be safety hazards in other conditions. We will see later in this essay. We will see what will happen if the guard rails are a few feet inside than normal, i.e., a few feet inside from the edge of the weather deck. This situation may reduce the curiosity to certain extent. Even if the person leaning , he may not get the full view on ship side. But the possibility of climbing on to the other side of the guard rails i.e., outboard is very less during underway.However increasing the guardrail height and increasing the distance between guardrails and the edge of the weather deck will help. If the guard rail height and the distance between guard rails and edge of the weather deck is increased, it would reduce the curiosity of any seafarer to lean and peep on to the ship side. If the man likely slipped near the guard rails , there is a chance of getting back since he will be falling on the deck. Raising the guardrail height and increasing the distance between guard rails and edge of the weather deck can be increased if there is a sufficient space between cargo hatches and guard rails and also depends upon clear walkway area without obstacles like pipes and other materials. These kind of arrangements is possible in Vessel more than 150 m length and in Vessels like Bulk carrier, Oil Tanker, Car Carriers and Gas Carriers. In the general cargo, chemical tankers and other small ships there are lot of pipelines running between hatch and weather deck so it will be pretty difficult to place the guardrails inboard.Various analysis and criteria should be governed for different size and kind of ship before considering raising and placing the guardrails inboard.Raising the guardrails height by 1 feet and placing the guardrails inboard by 1 meter will have various impact on different ships.It should be analyzed by class, flag state and other organization. Now due to the new guard rails regulated by me , there may be some inconvenience in liquid transfers , painting the ship’s side etc. In liquid transfers like fresh water and bunkers , the hose may be lead from little higher height to the pipe manifolds. But this is not the matter of the big concerns , it can be adjusted by passing into the leads or in between the guard rails. If the hoses are passed in-between guard rails, there will be stress developed on the guard rails. So the guard rails near the bunker manifolds and Fresh water manifolds should be strengthened. But overall from my analysis guardrail regulation will not affect much on merchant vessels. Now one of the biggest concerns in this situation is how will the crew member will know if one of the person goes overboard when he is working in a remote area. In this above case, John able seamen is working on a poop deck alone went overboard and it was noticed couple of hours after the incident has happened.Need for introducing the system to identify immediately after the person is overboard should be done. This kind of systems can only be done by introducing electronic technology. So the system should immediately notify the watchkeeper in the bridge. Now each crew member should carry RTLS ( Real time locating system) tags. RTLS tags will be size of a key chain and can be easily carried by the seafarer. Real time locating system tracks the person or object in contained or defined place like building, ship etc., using RTLS tags. The RTLS tags can transmit information to the receiver in the form radio frequency in the ship. If the RTLS tags are told to carry by the crew member in the form of a wristwatch or lockets , the chances of forgetting them to wear can happen. So it should be the part of personnel protective equipment. The RTLS tags can be the integrated part of the crew member’s safety helmet. The Man overboard screen should present in the Navigation bridge. The position information from RTLS tags worn by the crew member are transferred via radio frequency to the output screen in the bridge. In order to avoid additional monitor in the navigation bridge , the monitor can be integrated with ECDIS ( Electronic Chart display Indicating System ) monitor.The boundaries of the crew member with RTLS tags should be set as per the shape of the vessel in weather deck. If the crew member with RTLS tag goes out of the boundary , i.e., if the person goes overboard it should immediately alert navigational bridge and other important place in the ship.Even the RTLS system will be very much useful in enclosed space entry. The man overboard system will have the facility of adjusting the allowance or the boundaries. For eg., The man overboard system does not set the exact boundary as the length breadth and shape of the vessel. The allowance of 1 meter or less is given when a person leans on to the ship side and for other outboard activity. The system should have the flexibility of setting the limits in the allowance and also to be on standby mode in the harbor. When there is no outboard work whilst vessel enroute the limits can set to zero and if there is some outboard work in anchorage the limits can set to 1 meter from the actual boundary of the ship. When the crew member with RTLS tag goes out of limit in the boundary of the ship it immediately alerts in Navigation bridge, Engine room , captain’s cabin and ship’s office. The reason it alerts the engine room is to alert the engineers for preparing the vessel for maneuvering. Once it alerts the engine room , the engineers can confirm with the bridge team and should immediately bring the engines to maneuvering RPM. In the captain’s cabin and ship’s office it will alert captain and other important officers on board. Apart from the above , when the RTLS tag goes overboard it also initiates to ring the emergency alarm to notify all crew that some emergency has occurred in the vessel.It also should automatically release the man overboard marker using solenoid valve which uses the magnetic principle. The system will automatically mark the position in radar , GPs , AIS and other bridge equipment instead of navigating officer making the man overboard position in each equipment. In any emergency saving time is directly proportional to handling the emergency safely. The distance between the guardrails and the edge of the weather deck should be increased depending upon the type and size of the vessel. The vessel should employ a real time locating system in the vessel, i.e., Each crew member should carry RTLS tags along with them and they will transmit their position continuously to the navigation bridge via radio frequency. If the position of the crew member goes outside limits set in Man overboard system then it will alert the ship. The first two points in the solution will reduce the percentage of person going overboard from the ship and reduce the intent of human being to do the weirdest things near the guard rails. Even during the heavy weather when vessel shipping seas in the vessel and takes the person away by the shipping seas, he will eventually get stuck in the guard rail due to the height of the guard rail. For this purpose the guard rails can be curved in order to protect the person during heavy weather.The second point in the solution concentrates on the rescue part. The sooner the vessel knows about man overboard , the easy and effective will be the man overboard operation. Now we will go to the next case in man overboard. The vessel MV.Ore Everest sailing from Guaiba, Brazil to Rotterdam, The Netherlands fully loaded with iron ore. The crew member named Johnson goes overboard by 11 am and it is reported to navigation bridge. The Navigating officer James May immediately raised the emergency alarm , Released MOB marker , Marked MOB positions in navigation equipment and performed various duties as mentioned in the company emergency procedure manual. After a few minutes the bridge team cannot spot the MOB marker in the sea in order to search the man who went overboard. And also marking done with the navigational equipment has half a mile error since it is marked after MOB marker release , raising the Emergency alarm and performing other important duties. After some minutes the crew informed bridge that the MOB marker had struck in the guard rail. There is a difficulty in spotting the person went overboard due to medium high swells. But the Vessel as a team managed to rescue the crew member successfully after the deep hurdles and injuries to the crew members. Let us analyze this situation in detail. There is a specific reason for me to imagine this situation. One day during my regular working days we were replacing old life buoys with the new life buoys. It was a windy day and the apparent wind direction was on the port beam. The crew member asked me to throw the bridge lifebuoy to the weather deck to him. When I threw the lifebuoy to the weather deck It is swinging to starboard side due to heavy winds in port beam.The distance between the vertical path where it should actually land and the place where the lifebuoy actually landed due to the curve path is approximately 2 meters. Since navigating officers are in hurry during an emergency situation , there is a likely possibility of the officer releases and runs back to the bridge to perform emergency duties. And in the majority of the situation navigating officer releases the man overboard in the side of the man went overboard. But in the majority of the safety procedure manual , it states that “release mob marker “ or “ release the mob marker onto the side of man went overboard “ and it doesn’t really doesn’t focus on whether that side is windward side or leeward. Majority of man overboard occurs in bad weather conditions. So there is a possibility on for the MOB lifebuoy swinging towards the deck . The each emergency situation should be analyzed carefully and the step by step action for the emergency situation should be prioritized according to the cause of the action. There is a need for standardizing the emergency procedure for the emergency situation is required. Different company follows different procedures and also different emergency alarms for the various situations. The emergency alarms should be standardized for all the vessels. The common emergency procedure manual should be prepared for all the vessels. The emergency situations like Man overboard , Abandon ship , enclosed space entry etc. don’t change much in the majority of the ship. If there is a change there should be ship specific emergency manual for particular situation should be there and the company and the flag state should able to convince the class for changing. The reason for emphasizing the common emergency procedure for all the vessel is during emergency brain takes the action and follows the procedure stored in the deep unconscious mind. It happened in one of our vessels. The navigating officer joined the new company and had joined the vessel just twenty days before. At his previous company his duties are with the bridge team along with the master mariner during emergencies but in his new company the duty is support team in-charge in the emergency situations. Since he served in previous company for seven years it is stored in his subconscious mind. During one of the small emergency situation , he ran immediately to “support team”. But some crew membered told him that he is the part of the bridge team , then he realized and ran again to the bridge team. This situation has led the master to handle bridge team single handedly without the concerned person for some time. There is a famous saying “ Stitch in time saves nine”. Time is the major issue in any emergency. Since releasing MOB marker consumes some time and it also affects with the other emergency duties like Williamsons turn etc., there is a need for introducing new system which can improve the time consumption and the current method of releasing MOB is required. Instead of operating the MOB marker near the bridge wing locally , it can be operated remotely in navigation bridge using solenoid valve or any other method. This will save time in the emergency procedure and can perform emergency duties more effectively. The next situation I would like to access is how to avoid the deviation of MOB marker and life buoy from deviating due to the windy condition and prevent landing on the weather deck and getting stuck on the guard rails and objects near the guard rails. In order to avoid this situation I would like to place extra two life buoys with a MOB marker near the extremities of the stern area of the ship on both port and starboard side. The two Lifebuoys near the stem area is activated remotely in the navigation bridge using solenoid valve or any alternate method.But some might argue that the bridge team can release on the leeward side. But again releasing the MOB marker on the side of person went overboard which is being the windward side and again releasing it on the leeward side will consume more time. And also in an emergency the navigating officer will not think about the wind and other factors. Since it is near the extremities of stern area, it will get released faster into the sea and there is no chance of deviation on to the deck and it goes along with the hull of the ship. 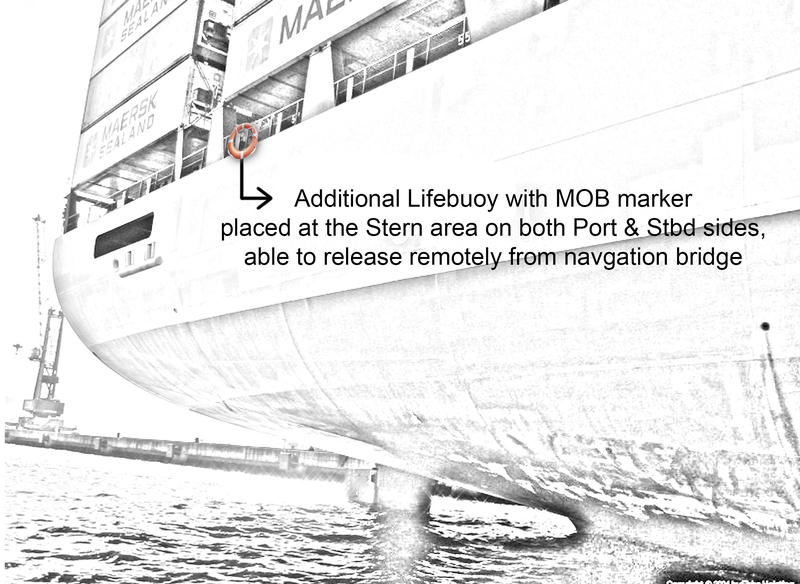 The two MOB markers near the stem area should be connected with the real time locating system in the vessel. If the crew member carrying the RTLS tag goes outside the limit set in man overboard system, it should automatically release the lifebuoy with MOB marker into the sea. The action is quick so it will save some time in emergency procedures and also the bridge team can perform other duties effectively. Keeping the MOB marker at the extremities at the stern connect with the real time locating system helps us better in rescue purpose also. If the RTLS tag carried by the crew member goes out of boundary set in the man overboard system, it activates the MOB marker automatically. There will be life buoy to crew member in the swimming distance and if even there is a swell which can affect the visibility of the lifebuoy to the survivor in the sea, the smoke signal and a flashing light will help the survivor to identify the life buoy to a certain extent. So there is a great chance of surviving and to catch hold of the lifebuoy when there is an extra adrenaline pump in the body. There should be additional two man overboard lifebuoy with the MOB marker at the extremities of the stern area. All four Lifebuoys with MOB marker i.e., two in bridge wing and two near extremities of stern area should be capable of releasing remotely from navigation ridge using solenoid valve or any other equivalent method. At least two man-overboard lifebuoy should be connected to real time locating system, which is capable of release the man overboard marker when the crew member with RTLS tag goes out of boundary in the man overboard system. There should be two emergency procedure manual in all the vessels. The general one should be with the actions with priority and explaining the reason for each sequence of action and priority of action. The other one should be ship specific and it should explain the reason for changing the action from general emergency procedure manual. If the each emergency situations and emergency procedures are analyzed separately under the people and organization with various backgrounds like shipping , mechanical , technology etc., there is a great chance of building a modern safety culture. It is my dream that in mere future that the world should look back at shipping safety culture.